Buy Palladium: Palladium Under $200! Platinum Under $1000! The metals are cheap! I'm really very surprised. Gold is relatively high, but we have cheap palladium, cheap platinum, and cheap silver. They are ridiculously low! Palladium has fallen under $200 this morning and platinum has fallen under $1000. For those with cash in their pockets now is a good time buy platinum online, or buy palladium online if you can find it. 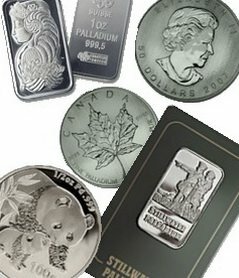 You can buy silver bars online much easier, but not at it's current low price. You can get these metals for under half the price they were selling for a few months ago. I was thinking about this yesterday and thought about selling some gold and buying Au, Ag, or Pt. I don't think it would be a bad strategy. $8 silver, $180 palladium, or $900 platinum while gold is were it is now would definitely lead me to make that choice. However, I'd have to be able to actually find the metals to buy at that low price! Right now you can't find palladium 1 oz for under $350!